An expert recognized for his uncovering the hidden, and often secret meaning of words, Kevin Hall now shares his wisdom with us all. In Aspire! he teaches readers to understand what words mean in their purest sense and unlock their importance as they develop a thoughtful new vocabulary. As Stephen R. Covey so beautifully elucidates in his foreword, "this masterfully written book will help you understand that words have an inherent power, a force capable of lighting one′s paths and horizons. Used correctly and positively, words are the first building blocks for success and inner peace. Used incorrectly and negatively, they are capable of undermining even the best of intentions. This is true in business, in personal relationships, and every other walk of life." By focusing on eleven words-one per chapter--Aspire! shows how to use these words as building blocks for success and inner peace. The words, from the very familiar to the very unusual, will become touchstones in personal development and in business. Kevin Hall is a highly sought-after business consultant, speaker, and coach. He was a partner in Franklin Quest, makers of the Franklin Day planner. As vice president of Sales and training, he helped fuel Franklin's worldwide growth. He has been recognized for his groundbreaking approach to uncovering the hidden, and often secret, meanings of words. Kevin is also credited with wordsmithing, and trademarking, the original slogan for the 2002 olympic Winter Games, "Ignite the Fire Within." He has been featured in Forbes magazine, Worth magazine, Nation's Restaurant News, Restaurant Business, and on the Food network. Kevin and his wife, Sherry, are the proud parents of six children. He enjoys cycling, running, flyfishing, cooking, and reading. “Once you pick this book up you will find it hard to put down. The layers of examples and principles inside a single word can prove life changing. This is a treasure that I will refer to over and over again. 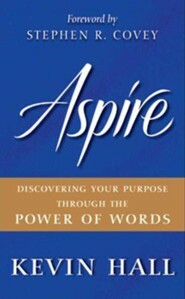 I'm the author/artist and I want to review Aspire: Discovering Your Purpose Through the Power of Words.